Oh. Don’t you just LOVE the english language?? Well, I wasn’t reminded of its lovely inconsistencies quite as much as I did as when I was trying to teach my little one simple reading skills. I created these cards for my great and brilliant friend Lorna who started her own preschool. 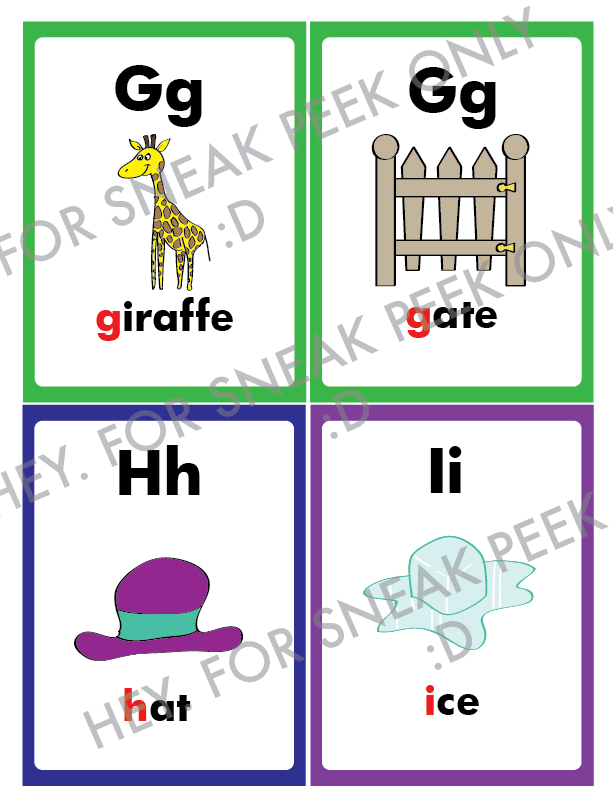 She suggested the idea of creating alphabet cards with ALL the sounds each letter had. When she mentioned the idea, of course I was all over it. It was basically exactly what I remember needing myself, but I never thought to follow through to actually creating a full set of cards. This was the perfect chance to create a set of flashcards that she and I had yet to see out there. 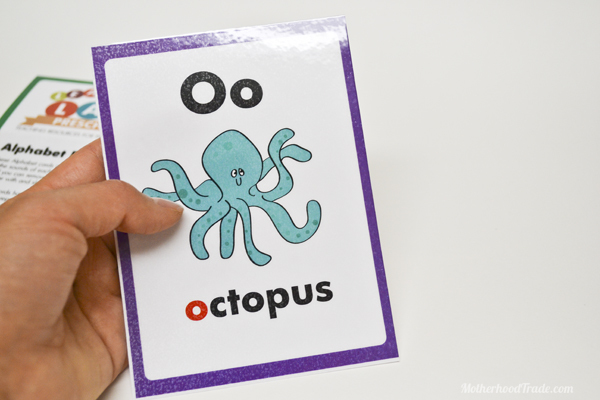 Not only do these alphabet cards include all the sounds of each letter, but many words have been selected that are 4 or 3 letters to prepare child for reading. 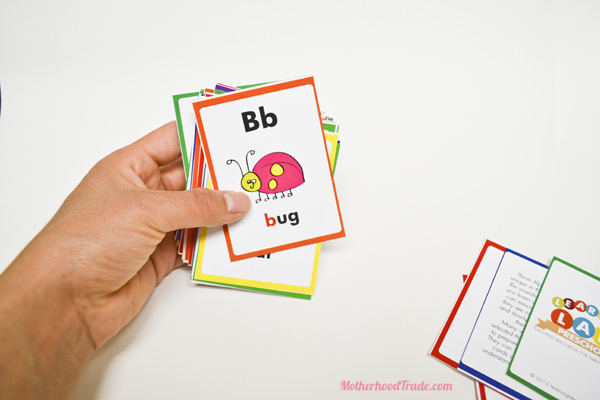 Most of which are CVC words (consonant, vowel, consonant) so the cards can transition to be be reading cards when your learner start to understand how sounds come together. 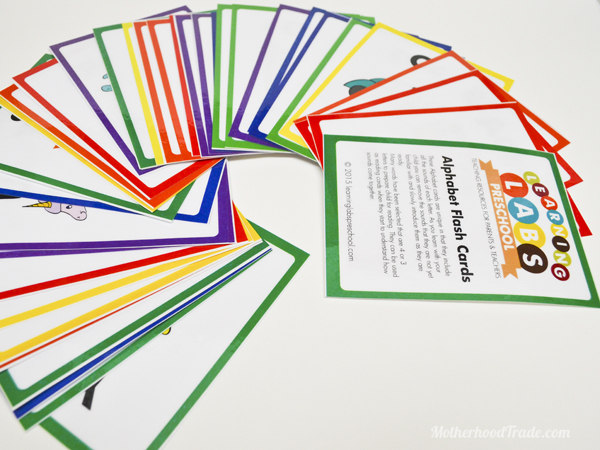 They are “color coded” as they follow the color spectrum, with duplicates of each letter being in the same color… just a little touch that might help little ones who are more intune with colors to put the alphabet in order. I created two sets: A smaller set that was given as a gift to the students in her class. They fit 8 on a printed 11×8.5 page. and a larger format for the teacher to use. They fit 4 on a page. Of course the sets can be used however and whenever. I had the pleasure of creating these cards from scratch: doodle to digital. I wanted to give them a friendly and fun feel for kids to enjoy and remember. I hope you and your kids can enjoy them too! There are 56 sounds total. Now, I do say ALL the sounds of each letter, and I did include what we thought were the most common and important sounds. But do remember that P is also for pneumonia, pterodactyl and psychosis (see here for a WHOLE song of this ridiculousness)…so there is no way we can cover all those silent and obscure sounds in the english language. 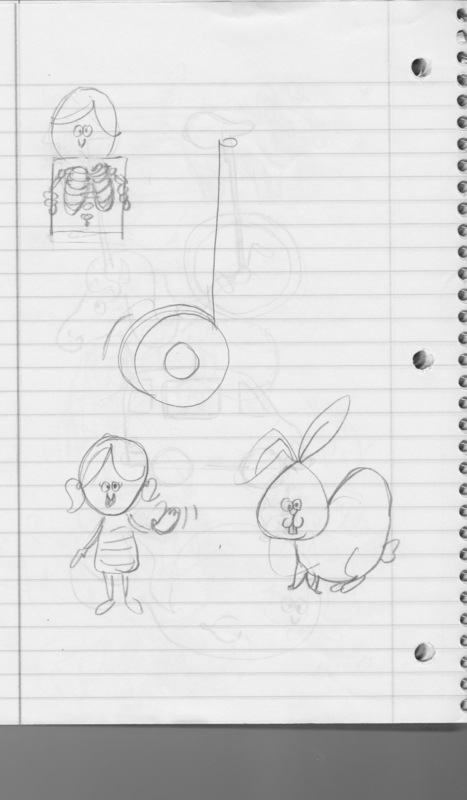 I did include “k is for knees” because a silent k seem common enough, though my husband did make fun of me for it. As always any teacher is welcome to remove any letter sound card until the student is ready to use them. Available here are as a printable for only a small fee for my work. Thank you!